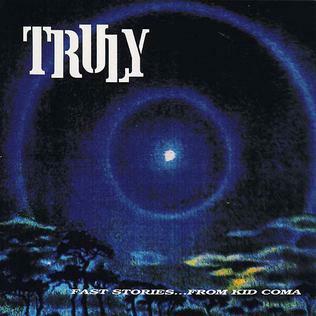 Fast Stories…From Kid Coma is an unheralded gem that was discarded and quickly forgotten amidst the rush to sign the next big thing in the wake of Nirvana’s success, Truly had the pedigree to get the attention of a major label since its members included Hiro Yamamoto of Soundgarden and Mark Pickerel of Screaming Trees, but their predilection for drugged, proggy riffs and dissonant ballads that drag on for twelve minutes disqualified them from the winner’s circle. I never dug the aforementioned bands that much, so it’s kind of surprising that I always keep coming back to this album years later since Truly kind of reminds me of a laid-back stoner version of Soundgarden minus the embarrassing emoting, Robert Plant-esque wails and eagerness to pen a hit. The wildcard in this equation is singer and guitarist Robert Roth whose lazy, deadpan drawl fits the nihilistic, doomed vibe of this concept album about god knows what. In addition, his guitar playing alternates between gorgeous metallic smears of feedback and majestic psychedelic riffing that is simultaneously elegant and damaged all at once. Another thing that set Truly apart from its peers was its unrelentingly bleak instrumentation and lyrics. There isn’t an upbeat note or verse to be found here. It’s an album designed for those looking to wallow in misery. At times, it even flirts with an oppressive arena rock take on goth ala the Cure’s Disintegration on the slower numbers, albeit with more testosterone and a passion for 70s metal and hard rock. What makes Kid Coma appealing is the fact that it is such a stylistic mess as “Blue Flame Ford” somehow tosses My Bloody Valentine’s Loveless, Nirvana and some hoary classic rock riffs against the wall and it somehow achieves excellence. I’m not saying that the song is brilliant, but the juxtaposition of strange bedfellows works in mysterious ways here. However, the highlights of the album are the long, drawn out melancholy numbers where the band stretches out their legs and lets Roth slowly build an anthem from narcoleptic beginnings to ecstatic peaks and back again to mellower valleys. The duo of “Angelhead” and “Chlorine” last a grand total of twenty minutes, but squash all that I love about 90s alt-rock into twin ballads that whisk me back to stoned nights in my dorm room with an ill-suited hairdo and even worse fashion sense. I understand if Kid Coma disappoints you tremendously since it’s got its share of underwhelming moments to match its impeccable pinnacles, but the gentle, insistent tug of nostalgia gives it a glow that keeps me coming back more than I care to mention.